Fan decks are a unique way to present fabric in a compact sample while still being able to showcase many different colors. This sample can be “fanned” out with multiple pages with several SKUs on each of the pages. The swatches are typically straight cut or pinked along with the card stock it is glued on. This type of sample has been gaining traction in the market and is starting to become a popular presentation choice by designers. Many different product types can be used in this format. Leed is dedicated to creating the highest quality Fan Decks the market will see. Every fan deck that goes through our production facility is thoroughly inspected to ensure accuracy of swatch location, size, and alignment, as well as print and overall quality. We pride ourselves in our catalog of Fan Deck production. We have the ability to pink or straight cut your swatches. 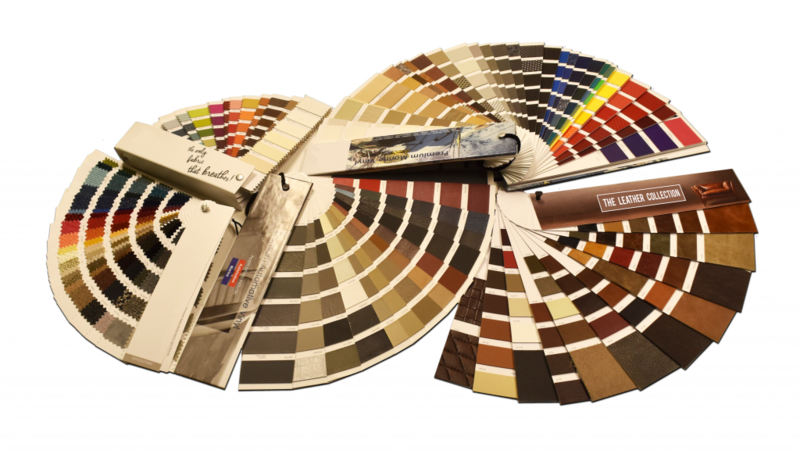 The swatches can either be glued tight, or partially glued to allow your customers to feel the product front and back. We also have the capability to create a case that fits around your Fan Deck which can be used not only as a cover, but an extra presentation piece with complex artwork and designs printed directly on it. Contact us to learn more about the best looking surface mounted swatch cards in the industry.